Made this little nest thingy (sorry for my lack of a better word--it's been a long day and I am a bit brain dead) from the clock I showed you in the last post. The back is on only temporarily as I still need to find some little blue eggs to put it in it. I think I need to straighten it out a bit too--needs a little tweaking. I painted the outside. I needed to put something on the inside rim to cover up to screws sticking up, that hold the base on. I used a burlap "ribbon". Your creativity truly astounds me girl! Thanks for sharing. That is recycling at it's best. If you would see that in an exclusive decorator shop you'd have to pay a pretty penny for it. 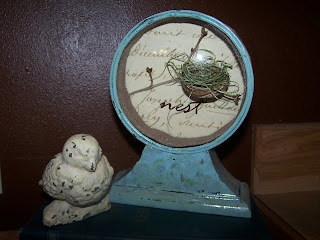 The blue goes so well with the nest and the little bird. You're so talented that I'm sure you can whip up some little bird eggs in no time. What a neat idea--very creative! That is so cute! I love the new use for old junk!! :) Perfect for spring!! And you know I love birds and nests! Oh my goodness!!! That is Beautiful!!! LOVE the colors! love your 'makeover' of the clock. very cute. I love the bird egg blue finish. So cute! That is adorable! You are very talented. Thanks so much for stopping by my blog yesterday! Hey, girlie! THIS IS ADORABLE! Thanks for sharing! How are things in Montana?! Happy Easter! So cute - love it! You are simply Too Cool.